Electric car drivers know it’s a challenge to charge up in downtown San Diego. 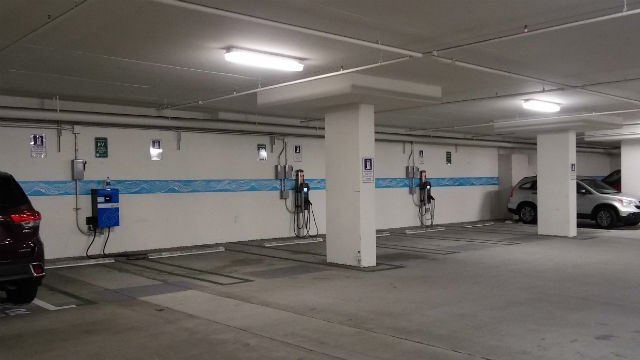 A few large (and expensive) parking lots have chargers, and many office buildings have a token number, but an EV driver seeking an affordable one-hour charge is generally out of luck. But what truly irks many drivers — myself included — are the numerous unused meters in two county parking lots downtown. One, a new structure on Cedar Street, has four chargers and is closed to the public during business hours. The other, underneath the historic county administration center, is open to members of the public with county business and has five chargers. I’ve shown up many days on county business and found myself the sole user. But even though this lot is open, the definition of county business is pretty strict. The parking lot operator employs attendants to chase after those parking to make sure they’re complying. Spending taxpayer dollars to prevent the public from using an underutilized resource seems particularly perverse. And for a county that is usually in the forefront of addressing climate change, it’s surprising that there isn’t an easier way for the public to access available chargers. It’s important to note that the county doesn’t pay for the electricity; EV drivers have to have their own accounts. And if the spaces are empty, no county employee is being inconvenienced. Perhaps the lots could be opened to EV users in return for payment of a fee equivalent to the fees charged by surrounding City of San Diego parking meters. It might end up being a small revenue generator for the county. Even better would be an aggressive effort by both the county and city to install more publicly available chargers on the streets and at government locations downtown. Making it easier to charge downtown would encourage more San Diegan’s to switch from gas guzzlers to clean electric vehicles. Chris Jennewein is editor and publisher of Times of San Diego and a long-time electric and hybrid driver.